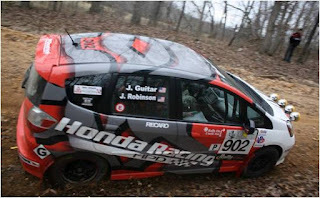 Team Honda Research (THR) partnered with HPD to showcase the new B-Spec Fit developed specifically for Rally competition at the second round of the 2012 Rally-America National Championship. "We had heard some great things about The Rally in the 100-Acre Wood and we were excited to run the B-Spec Honda here." stated James Robinson, Honda engineer and driver for THR. "Considering the fast and dry conditions expected for the weekend, we expected to be flat out in the Fit!" The Rally B-Spec Fit made its debut in 2012 Sno*Drift Rally, but was unable to finish due to an off-road excursion at the end of the first day of competition. "Of course, we were disappointed by the fact that we weren't able to finish the first round,” Robinson said, “especially since we were moving up the two-wheel-drive ranks, but we were able to prove out the setup we've developed and we were also able to get some valuable stage time to confirm the competitiveness of the platform. 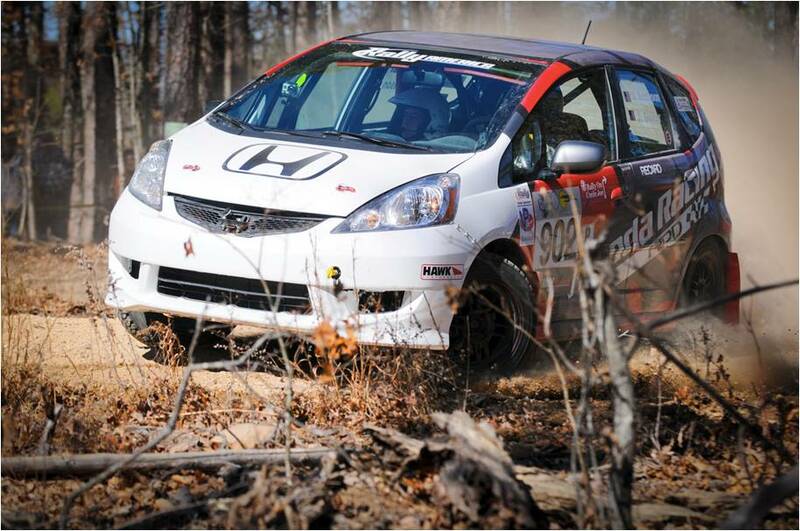 The damage we sustained was minor, so it was no trouble getting the car ready for The Rally in the 100-Acre Wood." THR started the fast and flowing second round of the 2012 Rally-America Rally series with the Fit in hopes of shaking off the poor start to the season at Sno*Drift. After a cautious start to the race, the B-Spec Honda Fit was able to build up a six-minute lead over the Factory Ford Fiesta Production car, and move from a starting position of 38th on the road to 28th. "The Fit is well suited to these types of fast, smooth roads - it is very controllable and gives the driver confidence to stay in the throttle," said James at the end of the first day of competition. Moving into the second day, the roads continued to prove fast and smooth. By the spectator Super Special Stages (Stages 11 and 12), the HPD Fit had extended its lead over the production Fiesta to 10 minutes. Said Robinson, "The roads here are fantastic! This is our first time to challenge this event, and the conditions couldn't be more perfect." Moving into the evening stages, the dust became a major factor, which caused many of the teams to slow their paces. 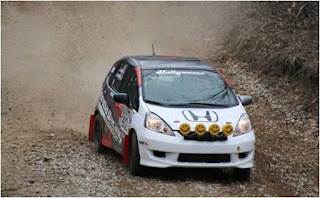 The final stage saw the lead over the Ford B-Spec team extend to 11 minutes, which meant that the HPD / THR Honda Fit succeeded in completing its first full event with no mechanical issues. "We are very pleased with how the car handled the conditions here - between the lessons learned from Sno*Drift and this weekend, we feel confident that the B-Spec rally kit we are developing will be robust and competitive for future B-Spec entries," stated James, at the rally’s completion. "We're looking forward to the rest of the events this year … Look for the THR team and the HPD B-Spec Fit at the next round! "